Do you ever open your freezer door and just cringe? You know there are chicken nuggets somewhere, but where are they? Or maybe you go to clean out your fridge and you find 3 opened bags of frozen vegetables. Believe me, I have been there done that! 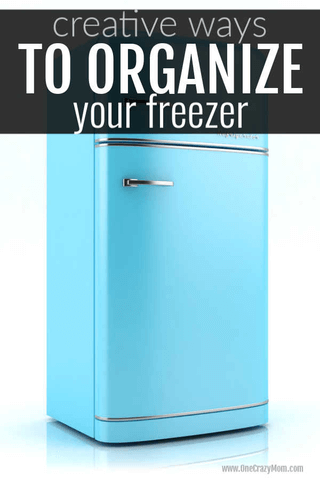 Today I have some creative freezer organizer tips you will love. It doesn’t have to cost a lot of money to organize your freezer, but by staying organized you can really save your family money. That is why I’m including this in our 30 days of saving money on groceries series. Here are some of my favorite freezer organization hacks! 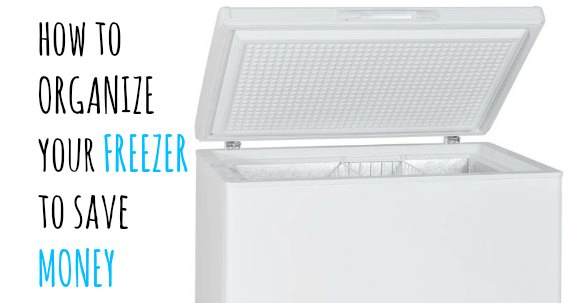 Give these simple and easy tips to get your freezer space in order. Once you see how to organize refrigerator freezer, it is very simple to do. Learn how to organize your freezer with these simple ideas. These ideas are easy to do and do not cost a ton. You will love these simple and frugal ideas. This may seem like a no brainer, but boxes take up A LOT of space in the freezer. Do yourself a favor and toss the boxes and organize the items into smaller bins. This will add so much space to your freezer. Did you know you can use magazine racks as shelving in your freezer? Just turn the racks on their sides and you can store smaller objects like baking chips and frozen vegetables. 3. Use a White Board. Use a small magnetic white board on the outside of your freezer to keep track of what you have. It is very easy to loose count of how many bags of chicken nuggets or frozen corn you have. The white board will keep your freezer inventory up to date. 4. Plastic Bins to organize. Have you ever seen the small plastic bins at Dollar Tree? These bins are great for keeping similar items in. Easily find packages of ground beef or frozen chicken when they are placed in their own bin in the freezer. I haven’t tried this yet, but I have heard of people using binder clips to hold partially full bags of frozen fruit and vegetables to the bottom of a wire rack in the freezer. I imagine this makes the bags much easier to see. I love my label maker! Not only does it help me see what I have in the freezer if everything is labeled, but it also helps the kids know where to put things away. If you want to use bigger labels, I love these chalkboard labels! If you are not happy with the shelving in your freezer, why not take out the factory shelves and add your own helper shelves. This will give you the opportunity to place the shelving only where you need it. This works great if you are trying to organize the upper portion of a fridge freezer. If you don’t like the idea of taking out the existing shelving, you can always add an under the shelf basket. I love putting together freezer meals, but they used to take up a lot of space in my freezer. Then I discovered these hands free baggie holders! I fill these up with my crockpot meals, zip them up and freeze things flat in plastic bags. Once they are frozen, I like to stand them upright in my clear bins so I can quickly and easily see what meals I have on hand. You can also stack on top. 9. Try using Reusable Shopping Bags. If you are trying to think of creative ways to organize your freezer and you have a deep chest freezer, you may want to try reusable shopping bags. It can be difficult to find everything in your deep freezer. However, if you have all of your beef in one bag and all of your poultry and fish in another, it will make it easier for you to grab just what you need. Ok, this might seem like an organizational tip to you, but hear me out. I love my FoodSaver. And yes, it saves me loads of money because it keeps our food fresh as the day I bought it. When you use a FoodSaver, all of your items will be vacuum sealed. With less air in your packages, you will be able to store more items in a fraction of the space. The only draw back of the FoodSaver is that it can be expensive. My foodsaver is doing great and going strong after several years. I cannot begin to tell you how much money the FoodSaver has saved me. I have never had to throw out food that saw stored in a FoodSaver. No more spoiled or food with frost bite from freezer bag seal. 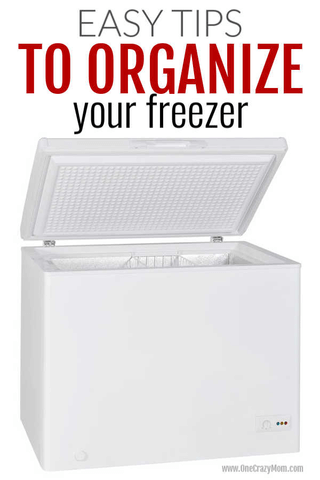 Get started with these easy freezer organization tips! 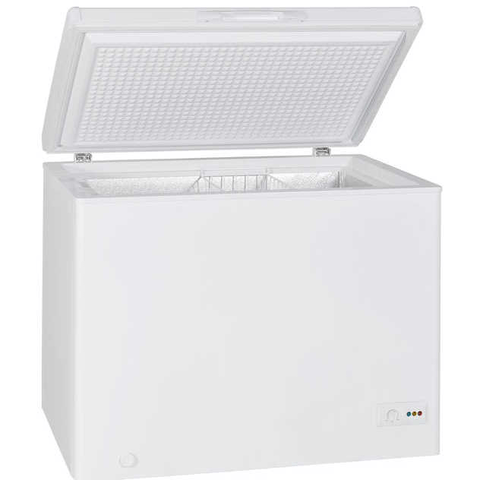 What freezer solutions do you use? What tips do you have for creative ways to organize your freezer? I’d love to hear from you! Now that you know how to organize your deep freezer, it is so easy! 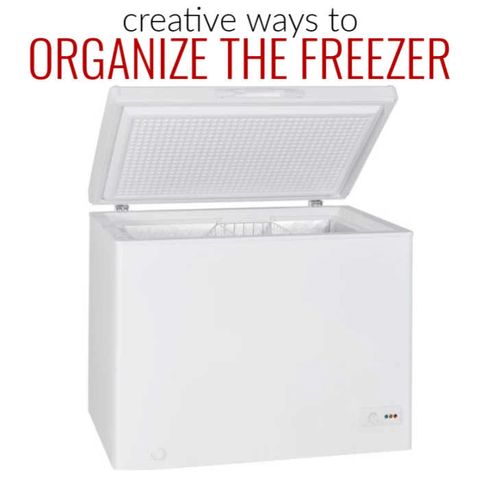 These tips also work to organize side by side freezer! Whether you have a top freezer, chest freezer or upright freezer, these tips will have your freezer food in order. Your freezer space will have the freezer inventory totally organized with these freezer solutions. From ice cream to whatever your chosen product is, the freezer drawer and freezer door will be in order. Eat foods you have and have less waste by knowing what you have. Find 17 easy pantry organization ideas that are budget friendly and easy to do.